Anderson Manufacturing Oops Kit because Springs and Detents can easily get misplaced when you are installing them and/or replacing them. Included in this Oops! 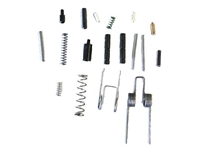 kit are the following items: Bolt Catch Detent, Bolt Catch Pin 3/32″ x 1/2″ Coiled Pin, Bolt Catch Spring, Buffer Detent, Buffer Detent Spring, Disconnect Spring, Magazine Catch Spring for AR15, Safety Selector Detent for AR15, Safety Selector Spring, Take Down Pivot Pin Detent (2 needed per rifle), Detent Take Down Spring (2 needed per rifle), Hammer Spring mil spec, 1/8 x 5/8 coiled Roll Pin for Trigger Guard, Trigger and Hammer Pin for AR15 (2 needed per rifle) and a Trigger Spring single stage mil-spec. All parts are made in the USA!! 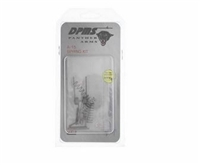 DPMS offers replacement components for the AR-15 that are made to strict military specifications. These high quality components will provide excellent fit and reliable function in your AR series rifle and are perfect for upgrading exisitng components or replacing worn or broken parts. Technical Information: Material: Steel. Kit Includes the Following Springs: UR-31 Rear Base Elevation Knob Spring, UR-05 Ejection Port Cover Spring, LR-32 Hammer Spring, UR-07 Forward Assist Spring, LR-22 Trigger Spring, LR-16 Magazine Catch Spring, FS-04 Front Sight Spring, LR-26 Selector Spring, LR-31 Disconnector Spring, LR-09 Bolt Catch, BT-08 Extractor Spring Assembly, LR-14 Detent Spring.Made in the USA!! Anderson Manufacturing AR15 "Vitals Only" Lower Receiver Parts Kit. Why buy a parts kit that includes a grip and trigger you are never going to use anyway? Buy what you need... Perfect for the builder who is going to use an aftermarket trigger/hammer and grip. Made in the USA!! Kit contents below. Anderson Lower Parts Kit for AR-15 without Fire Control Group and Pistol Grip: Bolt Catch, Bolt Catch Plunger, Bolt Catch Roll Pin, Bolt Catch Spring, Buffer Retainer, Buffer Retainer Spring, Magazine Catch, Magazine Catch Button, Magazine Catch Spring , Pivot Pin, Pivot Pin Detent, Pivot Pin Detent Spring, Selector, Selector Detent, Selector Detent Spring, Takedown Pin, Takedown Pin Detent, Takedown Pin, Detent Spring, Trigger Guard, and Trigger Guard Roll Pin. The CMMG Lower Receiver Parts Kit for the AR-15 is perfect for shooters who don't use the standard A2 grip or don't need more Mil-Spec fire control components cluttering their parts bin! This parts kit contains all other springs, detents and pins to build out a stripped receiver. This kit does NOT contain a pistol grip, hammer, trigger, disconnector or the springs. Made in the USA!! 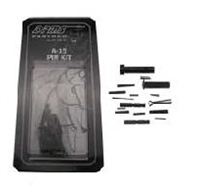 Complete AR15 Lower Parts Kit includes: Bolt Catch, Bolt Catch Plunger, Bolt Catch Roll Pin, Bolt Catch Spring, Buffer, Retainer, Buffer Retainer Spring, Disconnect, Disconnect Spring, Traditional Hammer (Black in Color), Hammer Pin, Hammer Spring, Magazine Catch, Magazine Catch Button, Magazine Catch Spring, Pistol Grip (A2 style), Pistol Grip Lock Washer, Pistol Grip Screw, Pivot Pin, Pivot Pin Detent, Pivot Pin Detent Spring, Selector, Selector Detent, Selector Detent Spring, Takedown Pin, Takedown Pin Detent, Takedown Pin, Detent Spring, Traditional Trigger (Black in Color), Trigger Guard, Trigger Guard Roll Pin, Trigger Pin, Trigger Spring. Made in the USA!! CMMG Lower Parts Kit for AR-15. Includes pistol grip, fire controls, springs, and pins necessary to complete stripped lower. All AR15 Lower Parts Kits now come in color coded pouches to aid in assembly. Made in the USA!! Spike's Tactical set out to offer the Best Factory Lower parts kit on the market! The lower parts kit they came up with exceeds Military Specifications by a long shot, they also have a much better fit, and finish! 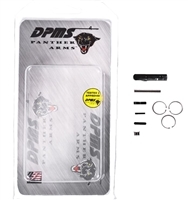 100% Made in the USA with a Each Kit Includes the following items- Rounded hammer (Works with ALL calibers), Trigger, Pistol Grip Screw, Safety selector, Bolt catch, Magazine catch, Front pivot pin, Rear take down pin, Aluminum trigger guard w/Spring loaded detent, Bolt catch spring, Disconnect spring, 2 Detent springs for Pivot pin and Take down pin, Magazine catch spring, Hammer spring, Trigger spring, Safety selector spring, Buffer retainer spring, Safety selector detent, Bolt catch plunger, Buffer retaining pin, Stainless hammer pin with Black Oxide finish, Bolt catch roll pin, Trigger guard roll pin, A2 Pistol grip, 1/4x28 Allen cap screw, Star lock washer for A2 grip screw. High quality AR-15 mil-spec lower parts kit with all parts needed to assemble your lower. Everything you need to finish your stripped lower. Parts are made in USA!